In almost every slip and fall or trip and fall case in Louisiana the injured party (plaintiff) will have to prove notice. Notice is a legal term that basically means that the party at fault (defendant) either created the dangerous condition (actual notice) or that the defendant either knew or should have known of the dangerous condition (constructive notice) that caused the slip and fall or trip and fall. In most every case the defendant will claim that they didn’t know about the dangerous condition such as water on the floor. In a trip and fall on a wrinkled or buckled carpet the defendant will claim they didn’t know about it and didn’t create it and therefore they didn’t have notice. In order to win a slip or trip and fall case in Louisiana you will most likely have to prove notice. Vincent “Trey” Glorioso, III of The Glorioso Law Firm has been handling and proving notice in slip and trip and fall cases since his very first case. Through years of experience and prior case knowledge, The Glorioso Law Firm has the experience to prove notice even in the most difficult of cases. If you have a slip and fall or trip and fall and suffer injuries you may need a personal injury trial lawyer. 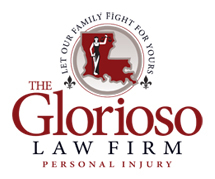 Therefore if you have been in a slip and fall or trip and fall accident in New Orleans, Metairie or any other city in Louisiana it is critical that you contact The Glorioso Law Firm as soon as possible. If you would like to know the top 5 things to do if you slip and fall please click this link.